The experiences of the various European immigrant groups who fought on both sides of the American Civil War are thoroughly documented by writers and historians. None, however, have captured the public’s imagination more than the Irish. In fact, the men who came from the Emerald Isle have reached the status of near pop icons within the realm of Civil War lore. Their images can be found in art, film and song. The names of Patrick Cleburne, Thomas Meagher and William Corby are widely recognized by students of the conflict. As distinguishing as these individuals may be, other names are not as quite well known. One of those is Myles Walter Keogh. Myles W. Keogh was born March 25, 1840 in County Carlow, Ireland. He was one of a dozen other children born to John and Margarete Keogh. In a household crowded with children, it is no wonder that Keogh remained close with his siblings through his entire life, writing to them on a near weekly basis. He received his education at St. Patrick’s College in Carlow but in 1860, he joined a force of fellow countrymen who traveled to Italy to defend the Papal States. During his service to the Pope, Keogh showed a knack for leadership, rising through the ranks to become an officer. However, an ocean away, a new conflict was erupting as the United States was tearing at the seams over the issue of slavery. In an effort to recruit trained officers the Union and the Confederacy sent emissaries to Europe. As fate would have it, Keogh was one of the officers recruited by the Union. Along with fellow Irishman Joseph O’Keefe and Daniel Keily, Keogh resigned his commission. On March 7, 1862 Keogh received benediction from the Pope. Ten days later, on St. Patrick’s Day-150 years ago-Keogh booked his passage for America. Arriving in New York and then traveling to Washington, Keogh was commissioned a Captain and assigned to the staff of James Shields. He would see his first combat of the war at Port Republic, where Stonewall Jackson sealed his victory in the Shenandoah Valley Campaign of 1862. After the battle, Shields’ force was recalled from the lower Valley and eventually sent to Northern Virginia. There Keogh was reassigned to the staff of Brigadier General John Buford. A veteran Regular Army man, Buford commanded a brigade of cavalry in John Pope’s Army of Virginia. Of all the officers Keogh served under during the war, he admired Buford the most. The affection was returned, as the Kentuckian quickly became somewhat of a father figure to Myles. While on Buford’s staff, Keogh would see fighting at such places as Second Manassas, Brandy Station and Upperville. He was at Buford’s side during his finest hour on July 1, 1863 at Gettysburg. Through the fall of 1863, Keogh participated in the harsh marching and fighting in central Virginia. The constant campaigning took its toll on his chief, who went on sick leave in early December 1863. He accompanied Buford to Washington, D.C. and was there on December 16 when Buford died in Keogh’s arms. With Buford’s passing, Keogh accepted an assignment on the staff of George Stoneman. Keogh traveled with Stoneman to the Western Theater and in April 1864, received a promotion to the rank of Major in the volunteers. Stoneman was assigned to command the cavalry in John Schofield’s Army of the Ohio. With the rest of the Western Armies, Keogh participated in William Tecumseh Sherman’s campaign to capture the city of Atlanta. He experienced his first major fighting in the west at the Battle of Resaca. In July, Stoneman received orders to destroy the Georgia and Macon & Western Railroads. Understandably, Stoneman wanted to do more. After destroying the railroads he requested permission to liberate the Union prisoners held in Macon and at Andersonville. Sherman agreed and Stoneman’s force set out in late July. Stoneman’s efforts at first appeared fruitful, as he began the destruction of the railroads. However, he would be surrounded by the Confederates around the town of Clinton. Ultimately forced to surrender, Keogh and Stoneman were taken prisoner and sent to Macon and then to Charleston, South Carolina. Both men were exchanged in September. After his release, Keogh entertained an offer of taking command of the 3d New Jersey Cavalry, fighting in Phil Sheridan’s Army of the Shenandoah. Ever loyal to the superior officers he served, Keogh declined, electing to remain with Stoneman. He accompanied Stoneman on raids in December 1864 and again in March 1865. Keogh was with Stoneman’s cavalry in North Carolina when word was received of Robert E. Lee’s surrender at Appomattox. In May, 1865, Keogh traveled to Washington to attend the Grand Review of the Union armies. While there, he would once again witness the death of someone close to him, Joseph O’Keefe. O’Keefe, Keogh’s old friend from his Italian days, had been wounded at the Battle of Five Forks. He passed away with Keogh at his side. Keogh returned to Tennessee, remaining with Stoneman at Knoxville for Reconstruction duty. The following January, Stoneman was assigned to Memphis and in June Keogh went to Nashville to serve on court martial duty. Several months later, Keogh would begin his final journey as a soldier, receiving a commission in November as a Captain in the Seventh United States Cavalry. Peace never really seemed to satisfy the adventurous spirit of Myles Keogh. When one conflict ended, he simply looked for and found another. During the American Civil War, Keogh displayed bravery and a deep sense of loyalty. After the Battle of Port Republic, James Shields wrote of Keogh as being the “noblest soldier on that field…a glory to his country and to his race”. Similar praises can be found of Keogh throughout the war from those he served with. In the fall of 1866, Keogh began his final journey as a soldier that would end almost ten years later. It is thus a fitting epitaph on Keogh’s headstone, a few simply lines for a man who lived knowing nothing but war. 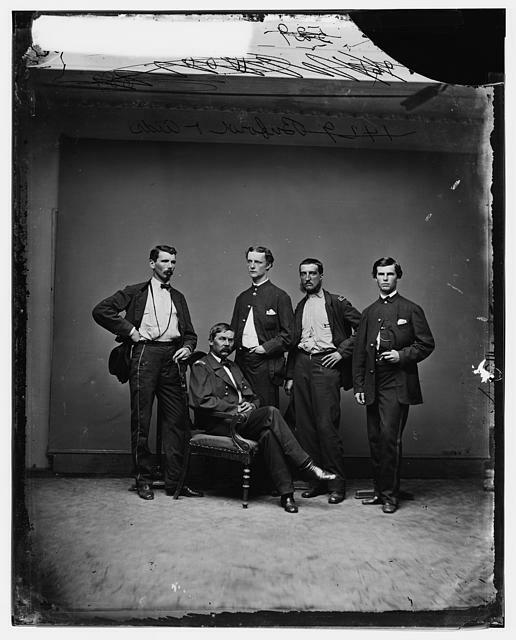 The photograph is of John Buford and his staff. Keogh is standing on the left, over Buford’s right shoulder. Photo Courtesy of the Library of Congress. Google can be strange sometimes. If you are interested in more information on Keogh, there are a couple of great books out there on him: “The Honor of Arms: A Biography of Myles W. Keogh” by Charles Convis and “Myles Keogh: The Life and Legend of an Irish Dragoon in the Seventh Cavalry”, edited and compiled by John Langellier, Kurt Hamilton Cox and Brian C. Pohanka. Myles Keogh wasn’t born in County Kilkenny, but at Orchard House, near Leighlinbridge in County Carlow. He was actually the youngest of 13 children—8 girls and 5 boys. His father, John Keogh, was a prosperous gentleman farmer, and his mother, the former Margarete Blanchfield, came from an old and distinguished Kilkenny family. Myles eventually inherited his mother’s childhood home in that county, but he deeded it to a sister and never lived there. He is indeed..I went back and looked at Convis’ book and the Langellier/Cox/Pohanka book and I am not sure how I mixed the two counties. I appreciate the catch, the post has been updated.